There are few things in nature more captivating than a rushing waterfall, and the Adirondack region is home to dozens of them! From small, roadside falls to massive cascades hiding deep in the woods, your mission to find waterfalls in the Adirondacks will take you to every corner of the Park. Browse the list of falls below, and start planning your expedition today. Be sure to exercise caution around these natural wonders, though, and admire them from a safe distance. Perhaps the most impressive waterfall in the Adirondacks, T Lake Falls requires a 10-mile round-trip hike to reach. Waterfalls can be seen in a picturesque spot easily accessed via a short walk upstream. 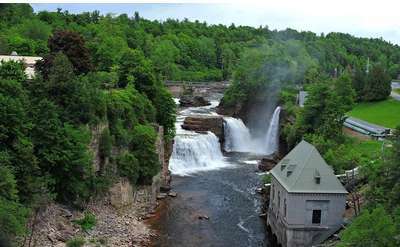 High Falls Gorge in Wilmington provides easy access to incredible views of four major falls in the AuSable River. This small, unnamed waterfall feeds into Shelving Rock Falls. OK Slip Falls - one of the highest waterfalls in the Adirondacks featuring a 200 foot drop - was unable to be seen by the public until 2,800 acres of land was purchased by the state in 2013. 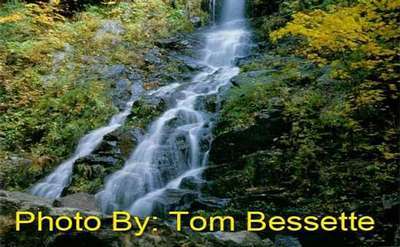 See two waterfalls less than 200 yards from the road. 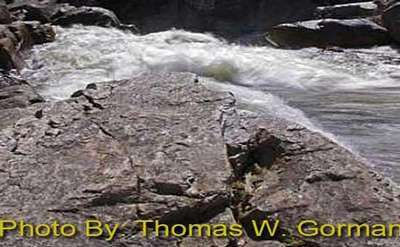 The first is right at the beginning and the second is just upstream and goes into a swimming hole at the base. 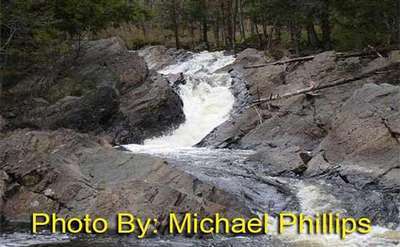 Wilmington Flume features four drops in the West Branch of the Ausable River, near High Falls Gorge. 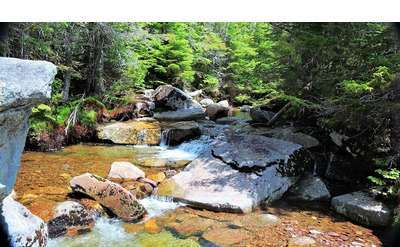 Pyramid Brook, a tributary to the Ausable River's East Branch, features a series of drops made less magnificent by the limited flow of water. 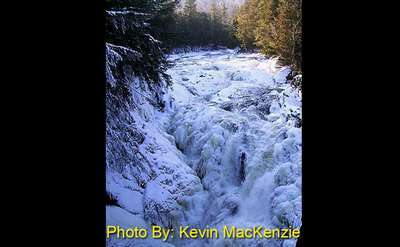 South of Keene is a wide, 20-foot-high falls on the east branch of the Ausable River. 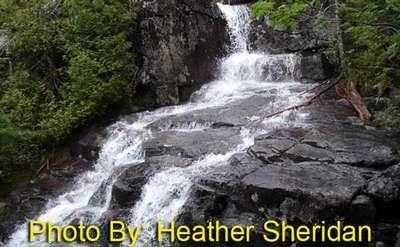 This waterfall can be difficult to find - the path is not marked, but is an easy hike once you find it. 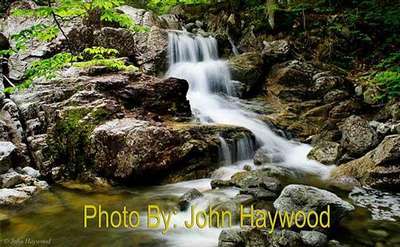 Just north of Lake George, you'll find two beautiful waterfalls on Northwest Bay Brook. Buttermilk Falls is one of the most visited waterfalls in the Adirondacks, mostly because the hike is very short, easy and flat. 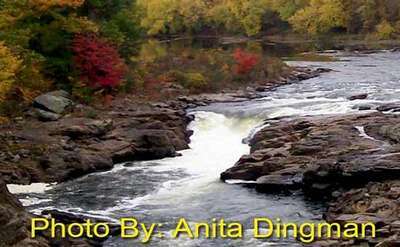 Whitaker Falls is one of the many scenic elements of New York's Black River Valley. The Grasse River's South Branch (along Tooley Pond Road) features six different falls. 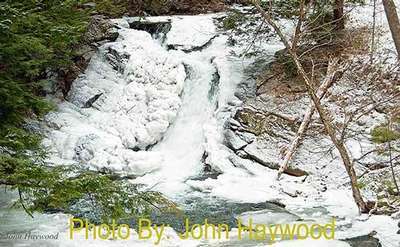 This 20-foot seasonal falls is located near the Clay Meadow Trailhead near Northwest Bay Brook. 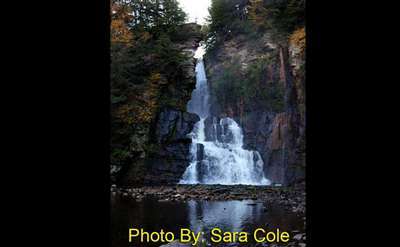 To see Moody Falls, travel 1.5 miles on NY 56 from its intersection at Sevey Corners with NY 3. 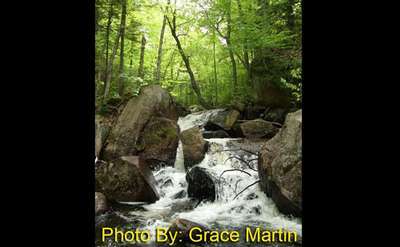 See a 5 to 6 feet tall waterfall surrounded by large boulders. 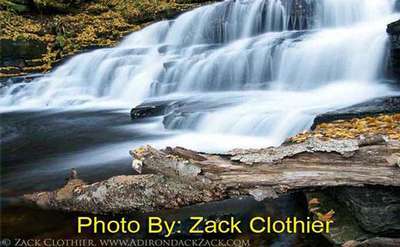 These picturesque, rocky falls are located in the town of Arietta, NY, but can be difficult to find. 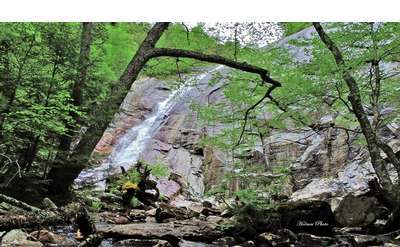 This 20-foot waterfall is accessible from the Whiteface Ski Center Parking lot. 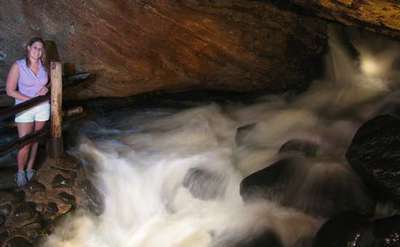 Death Falls is most impressive in times of high water and can be accessed by a flat trail that circles around a flooded area. 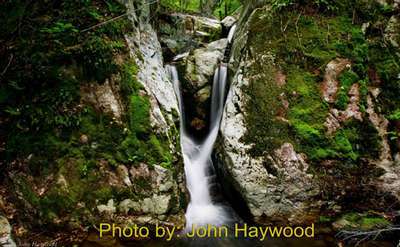 Squaw Brook Falls are small waterfalls by a roadside located in a rocky gorge by Squaw Brook. They're on private property. 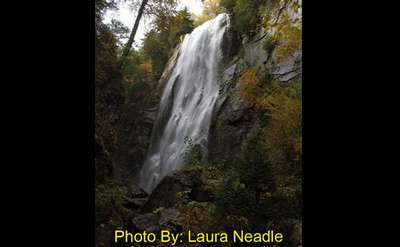 Beaver Meadow Falls is a 60-foot horsetail cascade falls on a tributary to the East Branch of the Ausable River. 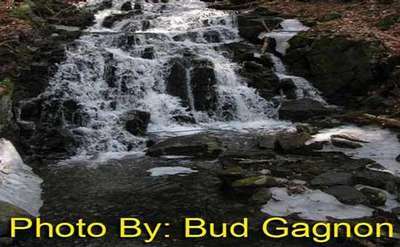 This large and picturesque cascading waterfall drops over 100 feet from Cascade Mountain. 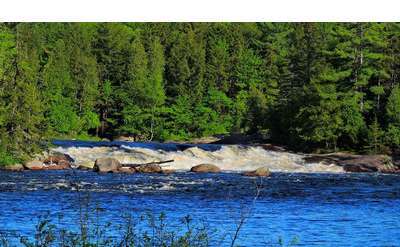 You can find Rockwell Falls just upstream from where the Hudson and Sacandaga Rivers meet in Lake Luzerne. 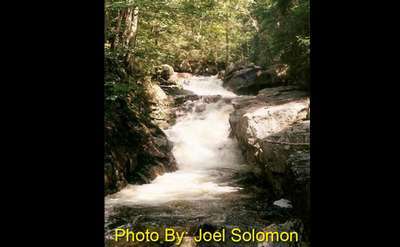 Mossy Cascade Brook Falls - also called Mossy Cascade - is a 40-foot-high drop in Mossy Cascade Brook, a tributary to East Branch of the Ausable River. Austin Falls is a long, sliding waterfall with rock formations surrounding it. 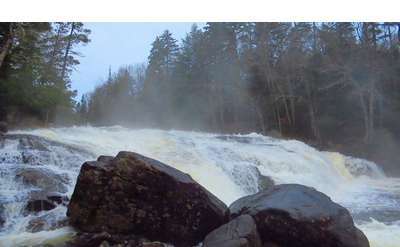 A large rock near the base of the falls hurls the water several feet into the air. 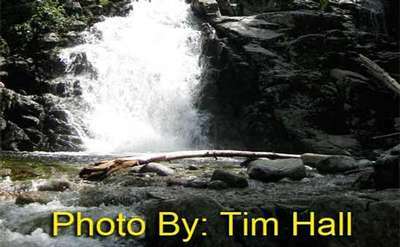 This natural waterfall was enhanced by a concrete culvert that was built at the outlet of Garnet Lake. The Falls of Carillon is located on the LaChute River in Ticonderoga's Bicentennial Park. The Bouquet River Falls is a set of falls in the Adirondacks' Essex County. Find a series of falls along the trail - the falls are 15 feet wide and nearly a half-mile long. 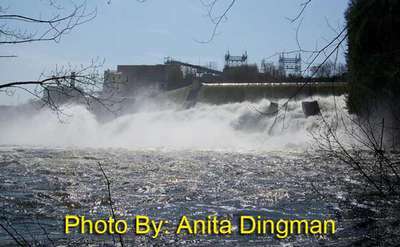 You will find this rushing series of rapids on the Sacandaga River in Wells, NY. 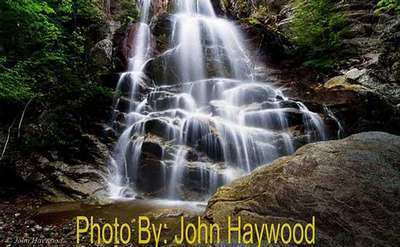 Locals refer to this unnamed waterfall as Greenwood Falls, since it is a series of drops in Greenwood Creek. 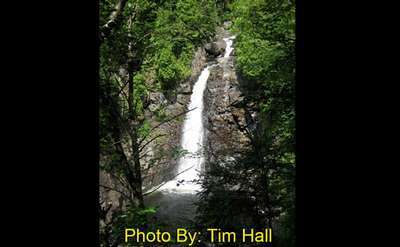 See three waterfalls at Groff Creek - the first two are fairly difficult to get to. The first waterfall is 30 feet in height. The other two are farther upstream and require a hike downhill to see them. 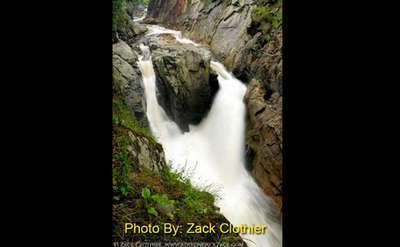 If you're hiking near Lake Colden in the Adirondacks, be on the look out for an unnamed 25-foot cascade. 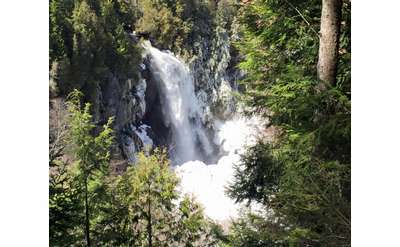 Roaring Brook Falls drops more than 100 feet in two segments. 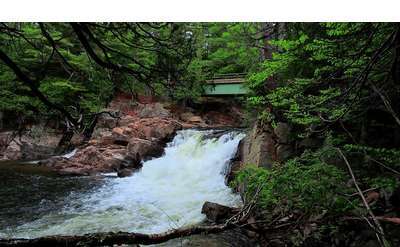 Follow a 1.3-mile hike one way along the Northville-Lake Placid Trail to the falls. 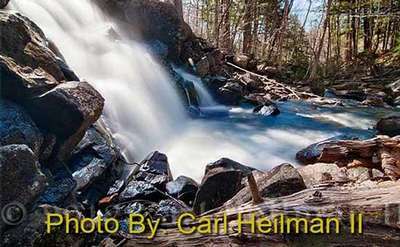 A 5 mile hike up Johns Brook from Keene Valley will lead you to this 20-foot waterfall. Hike 2.5 miles one way to West Branch Gorge - this should only be done in the middle of the summer when the water levels are low. 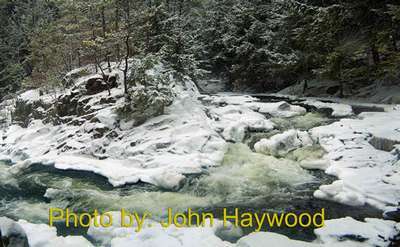 The falls go through a narrow gorge of the West Branch of the Sacandaga River. One of the rewards of the Shelving Rock hike is this spectacular waterfall on the east side of Lake George. 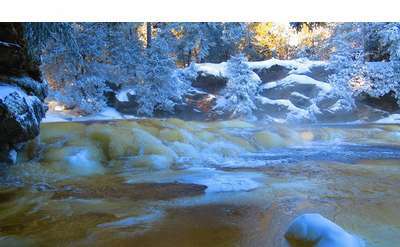 Wilmington Notch Falls is a thin, but powerful 50-foot cascade in the West Branch of the Ausable River. 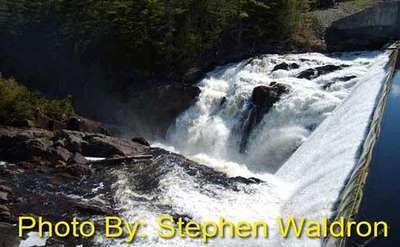 Indian Falls is a 25-foot-high waterfall on Marcy Brook adjacent to the Mount Marcy Trail. The entire stretch of the river has one drop after another. 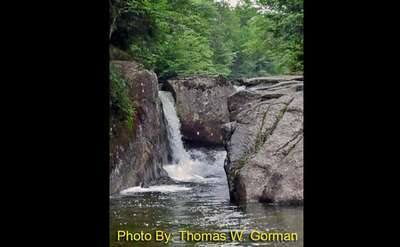 The top of the falls is a broad rock slide about 40 feet long, with a pool of water towards the bottom. The best way to reach Dug Mountain Brook Falls is by canoe from the DEC Indian Lake Islands boat launch. A two-part waterfall where Hague Brook meets NY 8. 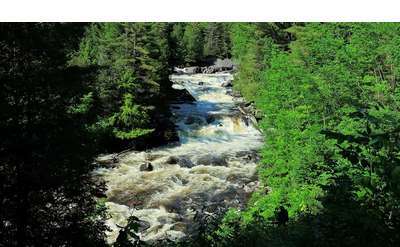 Flume Falls is a series of drops in a narrow section of the Ausable River's West Branch that total roughly 60 feet. 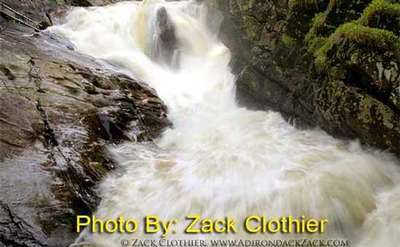 Schroon Falls is a 2-foot drop in the Schroon River underneath Route 9. 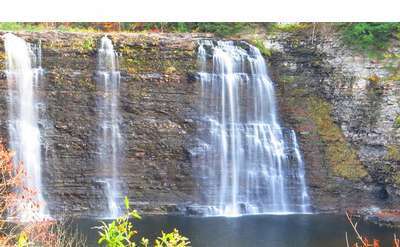 This privately-owned park features well-maintained trails and bridges that provide excellent views of Climax (50 ft), Rainbow, Mini, and Main Falls. 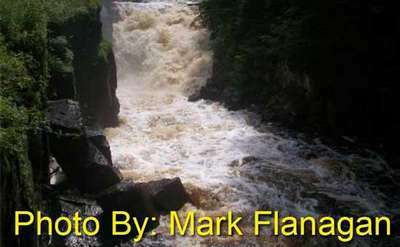 Artists Falls is a 20 ft high cascade in Gill Brook, a tributary to East Branch of the Ausable River. Additional falls can be found upstream. 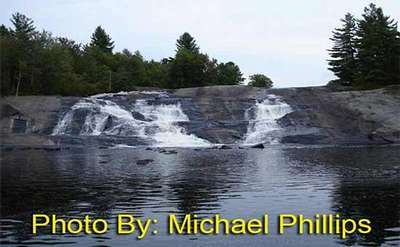 This impressive 35-foot Adirondack waterfall is in St. Lawrence County, cascading over a wall of natural rocks. 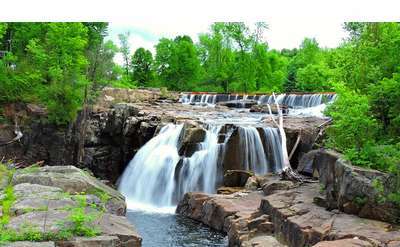 Located at Ausable Chasm, a popular Adirondack attraction, is Rainbow Falls. Staircase Falls (sometimes called Stair Falls) is made up of several small drops in Crown Point's Putnam Creek. A half-mile hike on a level trail is rewarded by an incredible view overlooking Lampson Falls. Hoisington Brook Cascade is a small falls under a stone footbridge in Westport. 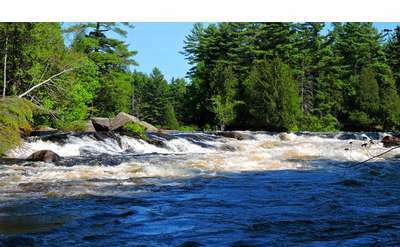 Explore some of the Raquette River's rushing falls and enjoy a challenging 5-mile one-way hike. 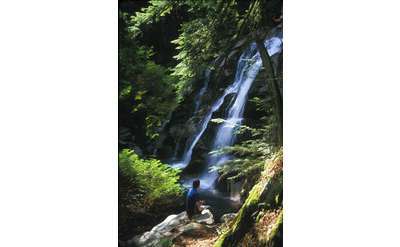 Tenant Creek Falls is a .9-mile hike through hemlock groves, mature open hardwoods, and scattered very large white pine. High Falls is located on the Oswegatchie River in the northwestern Adirondacks. Though these falls aren't incredibly high (despite their name), they are one of nature's subtle beauties. 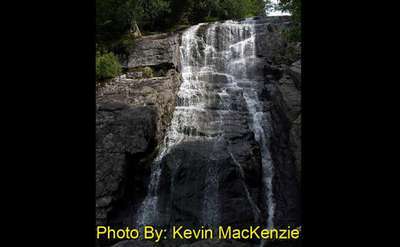 This 90 foot high staircase cascade is located on Gill Brook, upstream from Artists Falls. Rock Garden Falls got its name from waterfall guidebook author Russell Dunn, who found it resembled a Japanese rock garden. High Falls is located on West Canada Creek in Ohio, NY. 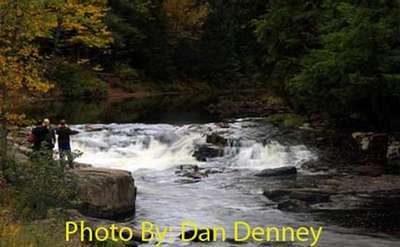 Wedge Brook, a tributary to the East Branch of the Ausable River, has a series of three falls. Just upstream from Hanging Spear Falls on the Opalescent River is a 15-foot cascade that is sometimes referred to as Opalescent Falls. Salmon River Falls is located in the 112-acre Salmon River Falls Unique Area in New York's Oswego County. The falls can be heard from the parking area - there is a small dirt pull-off behind the guardrails. The walk down is rocky and should be used with caution. Square Falls has a fairly flat plateau of bedrock at its top and a deep pool that is great for swimming at its base. Dunkley Falls has a large boulder at the base. Picnic facilities are on the premises and the Black Hole swimming area is near by. This falls is half man-made half nature-made, but it's a spectacular sight. Locally nicknamed Mill Falls, this waterfall along the Hudson River is in an industrial location. 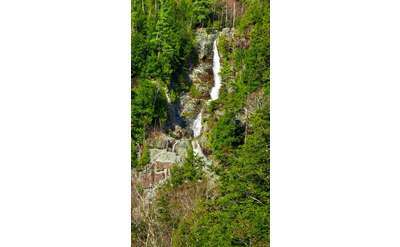 Split Rock Falls is a popular, picturesque drop in the Bouquet (Boquet) River. 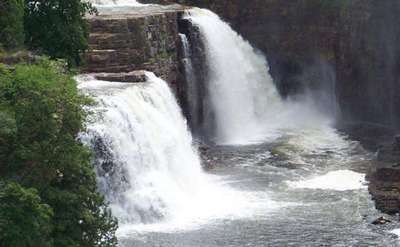 Situated in a narrow chasm on the Chateaugay River (west of the village), this spectacular 120-foot waterfall is the main feature of High Falls Park. Beer Walls Falls is a seasonal waterfall best viewed in the spring or after heavy rains. It might be dry during late summer months. 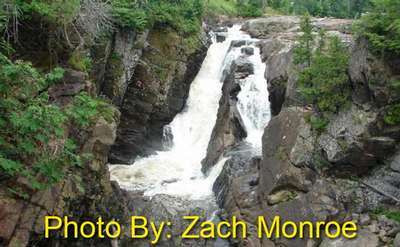 Just 3.5 miles south of High Falls Gorge on Route 86 is Monument Falls. 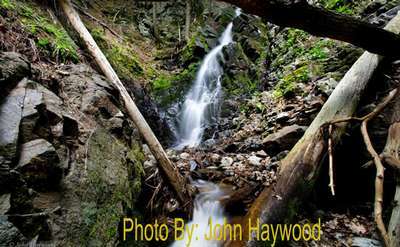 The journey along the Algonquin Peak Trail to Wright Peak will lead you to this 15-foot cascade, which is sometimes referred to as McIntyre Brook Falls and is sometimes unnamed. 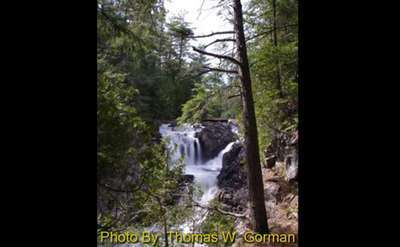 Located in the Adirondacks' Grass River Wild Forest, Harper Falls can be found on the North Branch of the Grass River. Rainbow Falls consists of 150 feet of cascades, which fill the gorge with a constant mist, providing ideal conditions for spotting rainbows on sunny days. 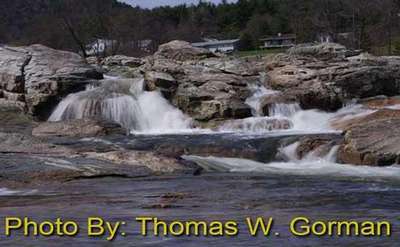 Wadhams Falls is a large flume falls on the Boquet (Bouquet) River in the center of Wadhams. 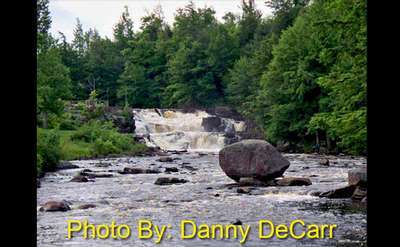 The falls consist of several drops, large blocks, potholes, and an 8-foot cascading waterfall on the east branch of the Sacandaga River. There is a small swimming hole at the base. The LaChute River in Ticonderoga, NY features LaChute Falls, a series of five different waterfalls located along the LaChute River Walk Trail. This 3-mile trail includes multiple wayside exhibits that illustrate the history of the area. 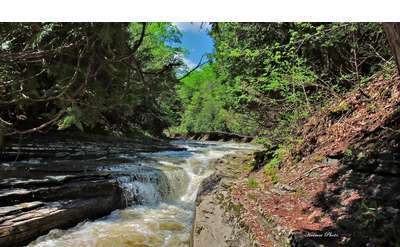 West Stony Creek Falls in Hamilton County is accessed by a 1.5-mile one-way hike along an old dirt road. 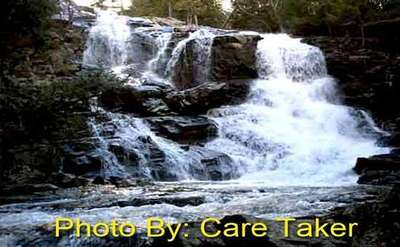 Wanika Falls is located on the Chubb River near Lake Placid and features a series of cascades. 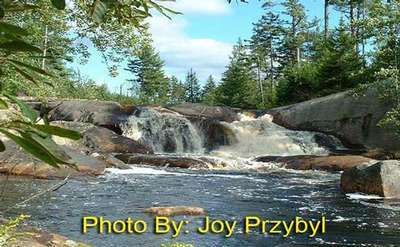 The Bog River Flow empties into the southern end of Big Tupper Lake, creating beautiful falls in the Horseshoe Wild Forest. 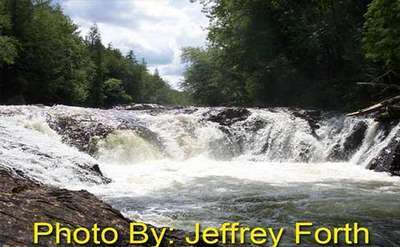 Jamestown Falls is one of the last sections of whitewater on Raquette River in Saint Lawrence County. 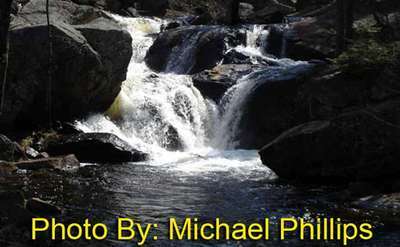 Rocky Falls is a small, 6-foot waterfall and lean-to on Indian Pass Brook near Heart Lake. 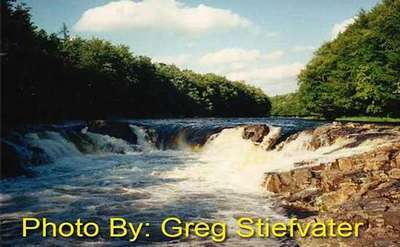 This Adirondack waterfall on the St. Regis River is located in the Town of Waverly, within the Village of St. Regis Falls. 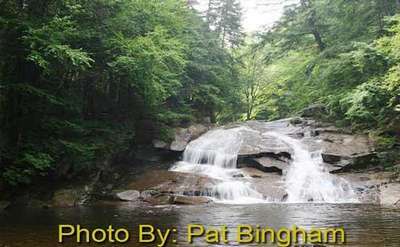 Blue Ridge Falls features several small, turbulent drops, and is located on a stretch of The Branch, which eventually empties into the Schroon River. 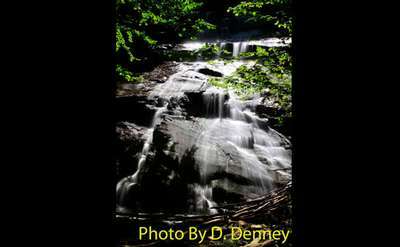 Located near the historic Copeland Covered Bridge, a trip to Beecher Creek Falls offers two rewards. Hanging Spear Falls is a 75-foot high, hourglass-shaped falls on the Opalescent River near Calamity Mountain.